What survives of the old martial arts traditions in China today? In the face of mass commercialisation, simplification and varying degrees of state control it is easy to assume little remains of the type of practice carried out before the modern era, but this would be a mistaken view. Old-style traditional teachers do exist in China, and they may be more common than might be assumed. They are not as visible as the masses of modern wushu practitioners, or the commercial schools and teachers with open classes, as they still teach small groups behind closed doors (at least metaphorical ones), and maintain the tradition of being careful in selecting students - often via a recommendation and interview process. However, the exact extent and degree of more traditional/historically authentic types of martial arts practice is impossible to determine because of many factors, including the fact that such teachers rarely advertise, pick students carefully from their families and immediate acquaintances, may take a considerable period to decide to offer to teach a student after first meeting them, maintain a variable degree of secrecy, and may also restrict access to information until students are deemed ready for it. The decision to accept a student may be made as much upon the demonstration of sincerity on the part of the student as on actual martial ability. Given the nature of the traditional relationship between teacher and student, if the teacher does not make his art known widely, the student will generally not do so either. The rare exceptions to this rule, together with the drive towards over simplification of the martial arts in the hope of winning mass appeal, have given rise to the popular martial arts of China. China is a huge country, and its land area is densely packed with villages and towns - most modern maps do not give a true impression of this as all but the largest places are omitted. This is true on maps of other countries as well, but modern Chinese maps take this practice to a more extreme degree than will be found elsewhere - even fairly large towns may be omitted. There are certainly many thousands of towns and villages in China, and a high proportion of these may have very small groups of martial artists practicing their own particular arts in a more traditional way. Group sizes taught by the more traditional teachers tend to be small, often with only one to three students per teacher, a far cry from the hundreds of massed ranks easily seen doing modern wushu. At the very least the "unknown" martial arts of China dwarf the well known ones in terms of numbers of arts, although obviously not in terms of numbers of practitioners. As a direct result of this situation, no one can say for sure what is and is not practiced in China today. There is much that is known only to small groups of people within China of which there is no general knowledge whatsoever among the general population within China, let alone in the outside world. However, these apparent differences arise from a more fundamental issue, namely that what is generally categorised under the term "martial arts" (wushu) in the China of today differs materially from what the practitioners of pre-modern times termed "martial arts". To put it another way, the very meaning of the term "martial art" has significantly changed in the popular consciousness of most Chinese people, as well as in that of the average martial arts practitioner. Where once the term "martial arts" would have certainly related heavily to the usage of weapons practices, archery being a good example, today it generally does not. This is to the extent that most contemporary Chinese people would not consider the bow to be a martial arts weapon. Is the teacher paid to instruct? How difficult is it to become a student? Extremely difficult for an "outsider", variable difficulty for "insiders"
Special lightweight garments - martial arts "uniforms"
While the precise figures and information given in the table are guesstimates and open to debate, and there are obviously some teachers in China today who teach in a more traditional way, few would contend the gist of what is indicated - that is, that when we discuss martial arts practice as defined by its "average" modern adherents we are really talking about something very different from what went on in former times. A very clear issue that does not require percentages or degrees is that in former times there were no martial artists who did not study weapons at all, but today there are many. The first seeds of this change arose during the seventeenth century at the end of the Chinese Ming Dynasty and the beginning of the Manchu Ching Dynasty. At that time it would have been hard to predict what would happen as war was a widespread phenomenon in China, with the Ming government having to deal simultaneously with many large internal rebellions as well as the threat from tribes of mounted archers, such as the Manchu, from the North. Dealing with issues like this obviously cannot be achieved with unarmed people, and at that time, when armed banditry was also a major concern, unarmed martial arts verged on being irrelevant to the needs of both the state and the people. The Ming government by that time also had damaging amounts of internal corruption and damaging political intrigue, as well as a shortage of vital leadership qualities, which did not help the overall situation very much. However, despite the leadership problems faced by the Ming, they did have the benefit of formidable warriors who were highly skilled in the usage of a wide range of weapons. This meant that, despite the advantage that the Manchu had in terms of much stronger leadership (their early leaders such as Nurhachi and Dorgon can rank among the greatest generals of world history), battle tested warriors and excellent organisation, they still could not manage to conquer the Ming overnight. It was more than 50 years from the first Manchu raid into China in 1629 until the final direct Manchu (the Manchu rulers were now called the Ching Dynasty) conquest of Taiwan in the 1680s. During this period the Manchu adopted a range of different practices to maintain order among the various populations of ethnic Chinese under their control. Most notably from the point of view of this text, the carrying of weapons was often outlawed. While the Manchu themselves, and the Mongol and Chinese forces who had assisted them in the initial conquest, continued to be armed and to maintain their martial practice on this basis, numerically they were far outnumbered by their Chinese subjects - their victory having been achieved on the basis of better organisation and leadership than the Ming rather than numerical superiority. 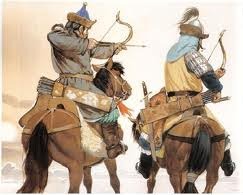 It is interesting to note that the Manchu favoured the bow above all weapons, and they were originally skilled archers. The Chinese were also originally skilled archers, but in some circles, particularly those relating to option 2 above, anything Manchu was tainted with a hint of being a traitor or collaborator. This factor may well have led to a reduction of the use of the bow among ethnic Chinese martial artists. So while the Manchu military and their Mongol and Chinese militias continued the practice of archery and other weapons, the native "ingrained" martial arts population among the ethnic Chinese began to reduce somewhat the number of weapons studied and focus on those which could be easily concealed. Favoured weapons included smaller jian swords and dao type blades, as well as weapons which could be claimed to be for another use, such as the staff used for walking or carrying loads, or a shorter-than-battlefield-length spear with the point removed that could be claimed to be a staff. Straight swords (jian) were also often regarded as a symbol of social status and may have been overlooked by the authorities in cases where other types of weapons would not be acceptable. This might be likened to the practice of sword wearing at special events like weddings in a few European countries today, and indeed more so until very recent times. As a symbol of social status, the sword would be acceptable at such an event, but a bow would not be. Thus, there was a tendency towards smaller size in the dedicated weapons and towards non-specialisation in the larger weapons among the Han. Use of weapons that could only be associated with the battlefield, such as various types of specialised lances, halberds, war-hammers and war-axes, began to disappear among the general population, if not among the Manchu military and associated units. "The soldiers acted as if they were only playing the roles of soldiers, and were not real ones. It made us believe that they did not in fact even slightly know the real purpose of the funny roles they were playing." Quite rapidly the Manchu became dependent upon their Mongol allies in order to maintain civil obedience and protect the country, or at least their regime, from outside threats. Thus the highest standard of battlefield arts, especially archery, during the Ching Dynasty was among the imported populations of Mongol soldiers. The traditions of archery that these soldiers handed down to the present day are formidable, but do not exist in modern China so much as they do in the Naadam arts of modern Mongolia, to where many of the Mongol troops retreated with, or even before, the fall of the Ching. As the common population of China was largely agricultural and did not have widespread traditions of hunting (at least that were not sponsored by the gentry), it would have also been difficult to explain away a traditional composite bow and arrows - the construction of these weapons had become sophisticated and their intended usage was obvious to the authorities. However, a suitable stick and twine would have been a possibility among the "underground" practitioners. Only those traditions that could maintain a very high degree of secrecy could hope to carry on such practice. Much of the "legal" application of weapons during the Ching Dynasty was by local militias in keeping law and order, rather than for large scale battlefield engagements. In such circumstances, smaller versions of weapons were more often used than would be found on the battlefield as they were easier to deploy inside towns and cities - this may also have enhanced the overall trend towards smaller weapon size. The weapons employed in police usage would also normally be of a non-missile type. The many existing historical records of Ching military arts show that the process or reduction in the range and type of weapons practice was not a universal one at any point before the turn of the twentieth century, but the trend had been established, at least among ethnic Chinese, anti-Manchu practitioners. This trend was one that later generations of China's rulers would reinforce rather than overturn. Thus it was that the Ching were extremely poorly prepared to face the British in the Opium Wars that pre-shadowed the fall of the dynasty. On two separate occasions during the 1800s China failed comprehensively in its attempts to stem the British opium trade through force, and was severely damaged by British military actions. The outcome was that China was forced to make drastic concessions to the British. The most famous of these concessions was Hong Kong, but there were a great many others. The failure of the Manchu to deal with the British and other European powers further weakened their reputation among their ethnic Chinese subjects. Indeed, the story of the Opium Wars almost reads like a catalogue of disasters for the Chinese, with only a couple of very significant exceptions. A very few Chinese leaders, such as Li Xezu, He Yu Cheng and Huang Biao, realised that their outdated ways of fighting were no match for the modern military machine of the British and sought to learn from the British and introduce modern weapons to the Chinese armies, as well as persuading ordinary people to fight using militia tactics. In some cases the sedentary Han population, such as those who caused the near annihilation of a significant British force in Sanyuanli, proved a far more effective fighting force against the British than the official Ching soldiery. While there is no way to verify it, these peasants almost certainly included the more traditional type of martial artists who would not be seen dead in the Ching armies, but who could be persuaded to fight the British on ethical grounds. The fact that these "progressive" commanders proved to be effective in stemming the British actions in certain areas made their ideas very influential for almost a hundred years of Chinese history after that point. Due to these events, and the events of the well-known Boxer Rebellion and the resulting Allied Expedition of 1900, the perception arose that old fashioned weapons were useless in modern warfare, and that gunships, cannon, rifles and machine guns were the only realistic weapons to use. This type of idea became known as the Yangwu Movement. Clearly the success of the commanders who held this view and the defeat of the commanders who adhered to the old traditional weapons was detrimental to the continued practice of traditional weapons in China. Furthermore it did not go unnoticed that the best fighters in China were not in the military but in the general population, and that any commanders who could undertake the admittedly difficult task of making use of them (by whatever means) would be successful. However, the group with the least ability to do this were the Ching as most of these people were anti-Manchu patriots. This led to opportunities for other groups of politically involved people who did not have strong Manchu/Ching associations and led to the arrival on the scene of some of the more famous figures of modern Chinese history, such as Sun Yat Sen, Chiang Kai Shek and ultimately Mao Zedong. "Contemporary Manchus were originally barbarians from beyond our Great Wall. They caused a lot of trouble in the Ming Dynasty, and while China was in a state of disruption they sneaked in and enslaved our people. All who opposed them were slaughtered in their hundreds of thousands, and so we have been a people without a nation for 260 years." Although there were other views of the Ching, Sun Yat Sen clearly sums up the traditional sentiment of the Chinese against their north eastern conquerors. It has been said that history only records matters relating to the elite - few sentiments such as this were recorded openly during the actual reign of the Ching, even though they were clearly present. Contemporary sources on Ching Dynasty martial practices therefore relate mostly to the practices sponsored by the ruling dynasty. This then was the situation moving towards the end of the Ching Dynasty and entering the period of the Republic (perhaps during the hundred year period from around 1820 until about 1920): there were fairly openly practiced, and relatively easily accessed martial traditions carrying the stigma of Manchu treachery and collaboration, and along side them difficult to access "family" traditions taught behind closed doors in some degree of secrecy but having the anti-Manchu factor as a plus in terms of popular consciousness. Whether or not many of them actually were in fact anti-Manchu by that time, or even considered it as an issue, is a different matter altogether, but in a sense it does not have any bearing on this discussion as it was the perceptions of the general populace that would ultimately end up ruling the day. The subsequent history of martial arts would be determined mainly by the impressions held by the many, or rather the impressions that they were caused to hold, and not by the few as in former times. By this period an individual martial artist might well be involved in both open Manchu-approved martial arts and secret family arts simultaneously. While those traditions of the former type retained quite extensive weapons practice until the early years of the twentieth century, those of the latter had often reduced the range and type of weapons used even before that time. In the late Ching and early Republic many of the old barriers that prevented martial artists from exchanging extensive information between traditions were softened somewhat by the reduced effectiveness of the Ching as rulers and by the introduction of ideas from outside China. Popular figures appeared who were known for studying multiple different traditions, and rose to popular prominence. Such figures are perhaps best exemplified in the person of Sun Lu Tang, the founder of the Sun style of Tai Chi, who also studied Hsing I and Ba Gua among other things. Formerly complex and difficult to learn arts were increasingly simplified for mass consumption, perhaps best exemplified by the figure of Yang Cheng Fu, grandson of the founder of the Yang style of Tai Chi. The idea of martial arts for health, rather than for fighting, also appeared, adding to the trend towards unarmed practice and away from weapons. The driving force for this was mainly that the "idea of martial arts" had become more popular, and instructors were finding that they could actually earn a living by teaching them if they could attract a lot of students - something that was previously almost unheard of. A good way to attract students proved to be making practice generally less harsh, simpler and avoiding too much in the way of weapons practice. The well-known differences in approach between Yang Cheng Fu and his older brother Yang Shou Hu are a very good example of this - although Shou Hu was known to be by far the superior martial artist, something Cheng Fu himself did not deny, it was Cheng Fu who attracted a very large number of students, while Shou Hu had hardly any. Shou Hu generally taught the un-simplified but harsh style of his grandfather for combat, while Cheng Fu taught a simplified form for health (though he actually died at a much younger age than the combat-oriented members of his family). Some printed literature relating to traditions that had once been oral also appeared, and several martial arts "classics", purportedly from earlier times, were "discovered". A trend arose through which a kind of "blandizing" of some of the martial arts began. It was subtle and slight at first, but as more and more figures like Yang Cheng Fu and Sun Lu Tang appeared and exchanged ideas, inevitably the traditional arts they studied began to lose a little of their depth and richness of character. Ever larger "official" associations of martial artists were formed and martial arts schools opened up, especially in the major cities. The beginnings of the commercialisation of the martial arts had begun in earnest. Increasing commercialisation had a significant impact on the nature of the relationship between teacher and student, and instructors came increasingly under pressure to deliver training that was more to the expectations of the students, that is, to teach what the students thought martial arts should be like, rather than what they actually were like originally. This increased the power of popular consciousness over the nature of martial arts just as China was entering the modern age. Nowhere was this more marked than in introduction of the modern ideas that martial arts relate primarily to unarmed combat, with weapons as merely "add-ons", and that health and sporting benefits can be a significant focus, or even the main focus, of martial arts practice. At the turn of the century (the 20th century, that is) the practice of many traditional weapons in China had already been significantly degraded, but the process of increasing simplification and unarmed-emphasis was far from over. With the weakening of centralised Ching authority among the first to take advantage of the martial power of the populace were regional warlords who built up private armies in various areas of the country. An early example or pre-cursor for building this type of power base was Yuan Shikai, originally a very high-ranking military official in the Ching government who came under suspicion from other members of the imperial court. When his patron Empress Ci-xi died Yuan was immediately expelled from office. The new Prince Regent Zaifeng only spared Yuan's life under pressure from some of Yuan's allies at court who were too well respected to be ignored. Yuan left court for his home base but maintained his military contacts. He also built up his own power base in the countryside and was subsequently able to return, forcing the Ching government to hand over all of its military powers to him. This initiated the so-called warlord period. Yuan had demonstrated that an individual could not only rise to significant power by his own devices, but also threaten and win out against the Ching government. One of the main movements that would go on to exploit this situation to the greatest degree was the Guomingdang (the Nationalist Party), which was originally founded in 1894 as Xingzhonghui (later renamed Tongmonhui, before getting its more famous and final name Guomingdang). The Guomingdang was not the most powerful movement in the beginning, and was but one of many such revolutionary movements that were involved in armed rebellion against the Ching. It carried out its first uprising in 1895 at a time when numerous popular uprisings came and went. The difference with the Guomingdang from other was that it was led by modernised Chinese intellectuals, some of whom resided outside China and were aware of western military practices. The organisation was very progressive, embracing western weapons and employing "people power" to a great degree. Thus where other movements fell by the wayside, the Guomingdang had persistence based on its holding a kind of intellectual high ground - it responded not to individual atrocities of the Ching, but rather to the general principle that the Ching had no right to rule the country based either on morality (they were highly corrupt), succession (as they were not Chinese) or on performance (they had catastrophically failed to stem the British). Over time the Guomingdang was able to build its base of popular support. The leadership of the Guomingdang were not in general fighters, they therefore had no particular compunction to maintain the use of traditional weapons and simply sought the best weapons technology available. Furthermore, because the leadership did not engage personally in the fighting it became very difficult for the Ching to combat the organisation - killing the soldiers engaged in the uprisings would not kill the Guomingdang itself. Among the more powerful of the anti-Manchu/anti-Ching groups included some larger groups that had been carrying on their operations in secret. These groups had many ethnic Chinese martial artists at their disposal who generally had a high level of martial arts ability. Having to operate secret they favoured easily concealed weapons. The Guomingdang quickly realised the benefit of using "ready-made" fighting forces in their campaigns and went to great lengths to cultivate good relations with the fighters of the secret societies. Among the larger and more famous of the secret societies were the Hong Kong-based Sanhehui who provided around 3000 martial artists in support of the first Guomingdang uprising. The society known as Gelaohui joined in with Sanhehui in the second uprising. While these secret societies were patriotic, they were generally non-political in outlook and so the Guomingdang was able to maintain firm control of operations. The Ching responded to the threat of the Guomingdang by trying to train new model armies in the provinces to compensate for the lack of ability of the established soldiery. However to a certain extent this back-fired as the new armies became the personal armies of regional warlords whose allegiances varies with their own immediate interests. Furthermore, new young officers trained in modern western military ways proved to be exactly the kind of recruits who would be interested in actually joining the Guomingdang. With weakening central control the regional warlords began competing with each other to gain strategic advantage which made the military situation very complex, and combat was frequent. In virtually all cases those who made extensive use of modern western weapons emerged victorious over those who employed more traditional types of weapons, which, given that this round of fighting would last for more than ten years until the revolution of 1911, served to make the practice of traditional weapons virtually useless for any purpose other than preserving the cultural heritage of the Chinese. The Ching dynasty fell at last to the Guomingdang in 1911, but Yuan Shikai, by that time the most powerful warlord in China, had become a rival power to the Guomingdang. Yuan Shikai now behaved like a true warlord, interested only in furthering his own interests and with no thought for what his role had been under the Ching. He held the line of supporting the restoration of the monarchy, but it was almost certainly himself that he wished to be the monarch, or at least the effective ruler with a puppet emperor. 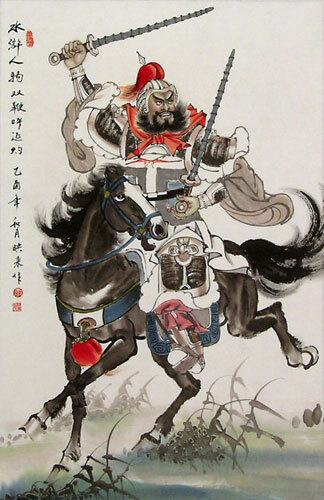 His army (called the Beiyang Army) proved too difficult for the Guomingdang to face, and indeed recruited many of its commanders from the Guomingdang. Therefore the Guomingdang was unable to consolidate its control over the country, making the regional warlords effectively the dominant powers in the land. This time was one of great technological modernisation in China, when the traditional martial arts were pushed aside in favour of western ways of fighting. Those who preserved the old traditions did so mostly out of honour to their predecessors, while a new breed of commercial martial arts instructor appeared to sell a new bland, simple and often unarmed form of martial arts to the general populace. This was done more as a past-time rather than as a realistic method of fighting modern warfare. This encouraged people who would never have become soldiers or fighters in previous times to take up martial arts and this group started to become increasingly physically distinct from those involved in the fighting. Thus the separation of military and martial artists begun through secret practice of banned arts under the Ching was greatly amplified in the early Republic and warlords period. However, the period was not entirely chaotic and some semblance of a parliamentary democracy started to be introduced. One of the most enthusiastic supporters of the parliamentary system was Song Jiaoren, the leader of the Guomingdang, who looked set to become the first prime minister of China. However Song was assassinated in Shanghai in 1913. When it became clear that Yuan was behind the assassination he could not pursue his own hopes of election and therefore had to resort to force to rid himself of the Guomingdang altogether. This instigated the so-called Second Revolution. Initially Yuan was successful, removing the Guomingdang from virtually all central and local government and he cleared the way for the establishment of his own dynasty, which during the period 1915-1916 looked set to happen as Yuan set out to manipulate public opinion. He decided to formally take the throne on New Year's day 1916. However he greatly underestimated the influence that Sun Yat Sen and others had had on the public consciousness, and so when Yunnan province declared its independence in 1915 many people flocked to the anti-restoration banner. While Yunnan could not militarily hold out against Yuan it became clear that through pressing his case against the province he was losing his own base of support. The ensuing situation made both the Guomingdang and Yuan too weak to combat the warlords and other powers, descending the country into a chaotic period that lasted until a nominal unification of China was eventually achieved in 1930. During this chaotic period there were many more soldiers and weapons in China than there had been under the Ching, but the weapons were virtually all western and the soldiers were not necessarily the same people as the martial artists, although many martial artists were indeed soldiers, the emerging numbers of practitioners of modern simplified, mass-consumption martial arts finding a soldier was the exception rather than the rule. More likely were shop keepers, merchants and factory owners who would have been unlikely to learn martial arts in former times when such skills would have been deemed beneath them. The incessant fighting between the warlords in the 1920s brought the country to the brink of economic ruin. In the mid 1920s Sun Yat Sen promoted his young prodigy, a military general called Chiang Kai-shek to the position of head of the Guomingdang's new military academy. Chiang, who had been trained by the Japanese and even served in the Japanese military, was the main military liaison between the Guomingdang and Russia, and he studied the Russian military extensively. With this kind of background it was quite natural that he would promote the development of a fully modern western-style army, which he proceeded to do with great success. When he subsequently became the leader of the Guomingdang he was able to use his new army to subdue the warlords within just a few years. "Although the command of war is an art, science is still the basis of war and of military education." From 1930 onwards the new-style martial arts had little to do with the military whose development was very much influenced by the West and Japan, and when they did it was the individual exception rather than the general rule. Martial arts had become a cultural past-time with perceived spiritual and health benefits, as well as a means of sporting competition. The idea of martial arts as a means of waging war was all but dead, thus traditional weapons practice had ceased to have much meaning anymore. Rather than being perceived as the foundation of the martial arts, they were now seen as something to teach to advanced students once they had mastered unarmed skills in order to maintain their ongoing interest in the new forms of commercialised martial arts (in a commercial setting getting repeat business from one customer is naturally a good idea). Where traditional weapons were used they were no longer needed to be of anything approaching battlefield robustness. Traditional skills such as the sword-smiths techniques of pattern-welding which made blades highly resilient were all but useless where swords were used mainly for solo forms practice, and started to die out. In the closing decades of the 19th century Russia and Japan had begun to look at Manchuria as a promising candidate for the expansion of their empires. Ultimately this led to a clash of these two superpowers in both Manchuria and Korea, a conflict that has become known as the Russo-Japanese war (1904-1905). In the end it was Japan who emerged victorious, and Russia ceded all of its major interests in Manchuria to Japan in 1905. Following the 1911 revolution in China the warlord Chang Tso-lin gained control of Manchuria, but only through gaining military support from the Japanese who in return took over vast concessions of land in Manchuria. In 1915 the Japanese made further demands of China that the Chinese were forced to grant, including a 99 year lease on the territory of Kwantung and far reaching rights and privileges in Manchuria. During the chaos of the warlords period the Japanese effectively controlled large parts of China with the help of the native Kwantung army. Chang became over ambitious and was eventually assassinated by the Japanese in 1928. His successor Chang Hsueh-liang sided with the nationalist government in Nanking, rather than with the Japanese, which gave the Japanese an excuse to take punitive action against China, which they did by attacking and occupying the city of Shenyang. The Guomingdang were caught up with concerns elsewhere and so as not to antagonise the Japanese further they issued orders that the Chinese officials in Manchuria were not to resist the Japanese. Japan then rapidly took control of the whole of Manchuria, creating the puppet state of Manchukuo in 1932. Now began a period of massive industrialisation of Manchuria which was transformed from one of the more underdeveloped regions into the most industrialised region of China by 1945. This meant that very large numbers of Japanese nationals were sent over to China, including many Japanese martial artists who proceeded to have a large impact on the nature of martial arts practice in both China and Korea. More famous examples of non-Chinese nationals who were involved in this process include Ueshiba Morohei (founder of Aikido), Nakano Michiomi (founder of Shorinji Kempo), Choi Hong Hi (founder of Tae Kwon Do), and Takamatsu Jutaro (teacher of Ninjutsu fame), but there were a great many others. Japanese martial arts concepts, including the idea of grading or ranking systems and of coloured belts or sashes, were first introduced to Chinese martial arts through this means. The Japanese arts used Japanese weapons, so there was no drive to increase the usage of traditional Chinese weapons through this influence, and were themselves increasingly unarmed combat-oriented. During the second world war the Japanese further extended their grip on China, propagating this effect through other areas of the country as well. Popular unarmed Japanese martial arts like Karate and Judo, which were influenced by concepts of western military discipline, were used as propaganda tools in an attempt to indoctrinate the local population with Japanese values. Although this practice enjoyed limited direct success, it did influence to a great extent how the popular native martial arts were carried out. With the close of WWII the Japanese were expelled from China, and the Russians re-occupied Manchuria under the command of Stalin. While the Guomingdang took military action to regain Manchuria from the Russian communists they found that there was also a significant communist threat from within China, which led ultimately to Chiang Kai-shek's removal to Taiwan (where he went on to establish a long-running government) and the fall of the Guomingdang to the communists in mainland China in 1949. The rapid success of the Russian Revolution did not go unnoticed in China and many among the intellectual classes in China flocked to the Marxist banner. Even some of the Guomingdang, including Sun Yat Sen himself were impressed by what the Russians had achieved, which resulted in him sending Chiang Kai Shek to study their military methods. With the help of the Russian Comintern, the Chinese Communist Party (CCP) was established in 1921. The first National Congress of the CCP was held in Shanghai in the same year. It had only twelve delegates, but was nevertheless significant in that one of them was Mao Zedong. Initially the CCP cooperated with the Guomingdang since both organisations shared the goal of the reunification of China and the reduction in power of the warlords. Mao and several other CCP representatives were elected to the Central Committee of the Guomingdang in 1924. The nationalist outlook of the Guomingdang and the Communist outlook of the CCP was never a good fit, and their relationship came to an end as early as 1927 following the death of Sun Yat Sen, but in the meantime their collaboration had served to establish a strong foothold for the CCP in China. Many CCP members were killed in a coup that April and Mao fled to Jinggangshan with a small peasant army. He was later joined by Zhu De and other communist leaders. "Victory or defeat in war is determined mainly by the military, economic and natural conditions of both sides. But not by these alone. It is also determined by each side's subjective ability in directing the war. In trying to win a war, a military man cannot overstep the practical limitation of material conditions; but within these conditions he can and must strive for victory." Under Mao's able leadership and almost clinically analytical powers as a general the fledgling Red Army built its power base and eventually expelled the government of Chiang Kai Shek and unified mainland China under communist rule. Mao, being a Marxist, was very keen on "people power" and proved very able in raising armies from the peasantry. He believed that his soldiers should use the best weapons available to them, but if modern weapons were not available any weapon at all should be used along with superior strategy and tactics. The damage that Mao did to the martial arts in China essentially had nothing at all to do with the building of the Red Army before its victory in 1949, but had a great deal to do with the perceived political necessity of establishing his own hold, and that of the Party, over the country after that date. Mao's vehement dislike for anything traditional began to build during the 1950s. Initially he thought that collectivisation and major social reform would be possible in China only after the process of industrialisation had been completed. But in 1955 he made a dramatic U-turn and took the opposite view, namely that the rural masses could transform their nature, reform their social relations and be mobilized to revolutionary goals. This brought him into conflict with several more conservative members of the CCP whom he described as "old women with bound feet". Foot binding was an ancient practice in China that was perceived to have no place in the modern world, however in this case Mao used it as a metaphor for anyone who clung to traditional practices - including religion and indeed the martial arts, which came to be known in propaganda as "Rotten Old Traditions". To become truly communist the Chinese people were going to have to forget their cultural heritage altogether, whether they liked it or not. About the only thing that Mao didn't want collectivised was decision making in the CCP, and the rest of his life was virtually dedicated to establishing and maintaining his own control over the social order. Thus being a "revolutionary" of necessity meant that one was anti-traditional culture, and being pro-traditional cultural activities like martial arts therefore made one a counter-revolutionary (not a very safe thing to be under Mao). After his disastrous attempt in 1956 to allow the intellectual elite to introduce a range of ideas into the revolutionary process under the title "letting a hundred flowers bloom", Mao turned on them. Some were sent for re-education to make them more "red", and to work in the countryside - but many lost their lives. Monks and martial arts teachers either went back into secrecy or suffered the same fate. In the Great Leap Forward of 1958 Mao and the CCP tried to fast track the process of turning China into a model communist state, with the intention of leaping ahead of the developed nations of the world. This proved to be an economic disaster of almost unparalleled scale, and resulted eventually in the deaths of literally millions of people from starvation and associated illness. It is not known how many ancient martial arts died out during this period, but the number must be considerable given the numbers of those who died and the relatively small numbers sustaining the existence of each art. In 1959 Peng Dehuai, a senior CCP official, denounced the Great Leap Forward and was subsequently arrested, removed from his post and imprisoned until his death during the Cultural Revolution. From this time onwards Mao regarded any criticism of his policies as treasonous and famously began to act as if he were the new Emperor. However, Peng had some sympathisers within the CCP and Mao became paranoid about "new bourgeois elements" appearing within the revolutionary organisations. This developed to the extent that it became dangerous to be interested in or involved in anything at all that was not directly related to the revolution. The martial arts fell completely outside this categorisation, effectively making it dangerous to be interested in them or to practice them. The fact that so many great masters risked their lives and did indeed continue to practice in secret during this period is a tribute to the fact that the noble spirit of the martial arts had not died out entirely since the Ching Dynasty. In the early 1960s significant Chinese leaders such as Liu Shaoqi and Deng Xiaoping attempted (tactfully) to take steps to limit the damage created by the Great Leap Forward, including the use of individual incentives to motivate the workforce. Mao initially agreed to these measures but quickly began to view them as criticism of his Great Leap strategy. In 1964 when Liu refused to follow Mao's order to direct the main thrust of the "class struggle" against "capitalist roaders", Mao decided that Liu had to go. The Cultural Revolution was Mao's attempt to rectify what he perceived as the bureaucratic degeneration of the Party. Offenders such as Liu were subjected to public humiliation, and were imprisoned, beaten and tortured, often to death as in the case of Liu. The ensuing atmosphere of paranoia and harsh repression of anything that deviated even by the slightest degree from the party line lasted for some time even after Mao's death in 1976. During Mao's reign a sizable proportion of the population (informed estimates are in excess of 20 million) had died from starvation, execution and torture. Often these people were selectively targeted, meaning that they probably had a much higher proportion of martial artists among them than would have been the norm in the population as a whole. The traditional martial arts in China had perhaps reached their darkest hour, but there still was one more threat to their existence yet to come, but this was of a different nature altogether. It has been said that it is in some senses easier to kill an idea by misrepresenting it rather than by directly opposing it. Severe repression had not killed the traditional martial arts in China despite its application and re-application over centuries by successive regimes, but during the 1960s and 1970s the seeds of a sinister threat arose. This threat would proceed to grossly misrepresent the martial arts in the popular consciousness of the Chinese people. So subtle was its method of attack that it even managed to claim the collective name of the martial arts, "wushu", as its own so that the people would think that it was the very thing that it was killing. The analogy of the invasion of the body snatchers is an apt one. Getting hold of solid information on the history of Modern Wushu is extremely difficult. This is not because of any code of secrecy - the vast amount of information available on virtually every other aspect of Modern Wushu proves that beyond doubt. The real reason for this is that what is known as Wushu today has no real history to speak of. Modern practitioners claim a tenuous link to the National Wushu Institute established in Nanjing in 1928, although it is almost certain that what passes for Wushu today bears little resemblance to what was taught in that institute. A demonstration of a partial precursor of what would later become Wushu was given to Adolf Hitler at the 1936 Olympics, but the practitioners still knew how to fight (at least in an unarmed capacity) and the forms were too martially oriented to be called Modern Wushu - the real development of Wushu began under Mao in the 1950s. Develop health-only versions of older martial arts. Develop sporting "safe" gymnastic activities that appear to the uninitiated to be martial arts but actually have no "dangerous" martial arts content at all. "Safe" and "dangerous" do not refer to the physical danger of practicing martial applications, but rather to the political danger of being seen to contradict the line of the regime that old traditions are rotten. New activities like the modern, gymnastics-inspired sport of Wushu were therefore considered relatively acceptable, especially in that they involved displays of massed ranks of undifferentiated practitioners all looking the same and doing the same thing, which was very much in keeping with Communist philosophy that sought to destroy any kind of individual identity within the masses. Rotten old ideas like martial arts being for the purpose of fighting were eradicated resulting in a sport without any real martial quality whatever. The effort involved in eradicating the martial qualities of the more openly practiced traditional martial arts (themselves already negatively influenced by the factors described earlier in this article) was a substantial one as they still retained significant combative elements. It took large teams of experts, including figures like Zhang Wenguang, Chai Longyun and Sha Guozheng. Whether these relatively respected masters actually thought what they were doing was a good thing is in question - they simply had no choice so the question is in a sense irrelevant. The first demonstration of Modern Wushu was given in 1953, followed by the formation of an official government-sponsored Wushu governing body in 1956. The government's own rules for judging Wushu forms (as there was no other kind of practice) were released in 1958. These were heavily influenced by the rules of the western sport of gymnastics, and were phrased in such a way that a practitioner could not only do well, but actually win without having the slightest conception of the actual purpose of the moves that they were performing. Indeed, performing the forms in a martial way would in many respects breach the rules, meaning that a martially competent practitioner would be disadvantaged. Effective, minimal, efficient movements came to be penalised, while inefficient, overly large movements were promoted. For example, throwing away one's technique in a reckless/suicidal fashion, and positioning one's body in such a strange way that tends to adversely affect the ability to develop power are highly encouraged and valued in Modern Wushu movement. The fact that experienced practitioners of real martial arts could easily see that famous "lost" look in the eyes of Wushu practitioners, and the more recent rise of the "martial art without a soul" catchphrase, made no real difference to the subsequent popularity of Modern Wushu, which has been unprecedented. It was aimed by the Communist government at physical and mental indoctrination of the masses, and they succeeded admirably in their aims. Over the next 40 years Wushu grew to become the most popular sport of any type in China. While it was no longer in any sense a martial art, it's name (meaning "martial art") was suitably confusing to achieve the desired effect. Latterly, in recognition of the lack of any martial aspect to Wushu and in the climate of the relatively more liberal CCP of today, the western-style sparring-system known as Sanshou (effectively a type of kickboxing with some limited grappling) was introduced in 1989. However, this was a retro-fit that has little to do with Wushu forms and is still very western-sports rather than Chinese-arts oriented. The relationship between Wushu and Sanshou cannot therefore be compared to a true martial art with its inherent consistency between forms and martial application. People in China still prefer to practice a retro-fit, even though the original still survives. Sanshou does however illustrate the general trend - it is completely unarmed.